You seem to have missed paypal. I’m not sure I follow Wilf. PayPal can’t be received in Africa, and there are indications that they are purposefully closing down accounts that are accessed from the continent, even if it’s owned by someone from the US with a flawless history. I find the easiest means of transfer in Cameroon is to access my US bank account from an ATM machine. The ATM’s are sparse, especially in the provincial capital of Bamenda, but transaction costs were typically a mere $1.50 – $3.00. @Kelsey – I think it’s safe to say that you’re one of the few people who has a US bank account in Cameroon. The ATM option isn’t the easiest option to receive transactions for everyday Africans, simply due to the lack of bank account in-country, and many times lack of a contact outside the country who will give them an ATM card for their account in that other country. That’s very true. It is a very easy option if one does have a US-based account, one that perhaps is owned by a brother or sister living overseas. Very convenient and inexpensive. Right Kelsey – it’s a great option for people for those who can do it. Nothing beats it actually. 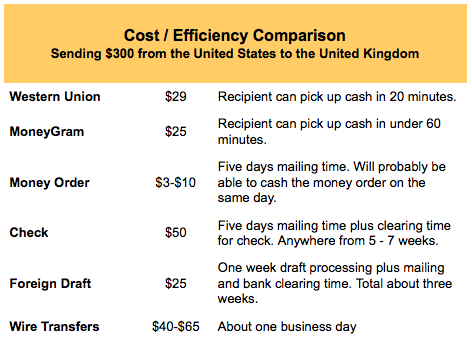 ATMCASH only charges $5 every time and has the lowest exchange rates. Why is no one talking about this company. My question, what about taxes and fees ?? As we wait for our online money transfer to catch up with the developed countries, cant wait for the mobile transfer to happen… been receiving money through western union wasting my precious time from work . Don’t get so cozy with Money Gram. Recently they’ve decided to step in as the consumer’s mother. I’ve been sending money to my friends in Ukraine for over five years, to help with language lessons, to pay rent/food/lights, and to send my own rent payment on my own apartment to my landlady. Well, some bright sole at MoneyGram decided that I’m being scammed, so they’ve closed my account and will no longer take my money. I just read on a consumer report blog that it’s been happening to others as well. It won’t be too long before our nanny state corporations will begin refusing our money at MacDonald’s if they can’t see our belts standing at the counter. I’d advise that you stick with Western Union. Money Gram’s attorney’s are going to kill their business.